Where can you go to get some of the world’s rarest chocolate? Some of the weirdest chocolate? Chocolate made with camels’ milk? Chocolate from Hispanola beans? Chocolate from a batch run so small the labels are hand written? No I mean it – Senfridges has now opened a chocolate library with one of the world’s most comprehensive collections of chocolate. 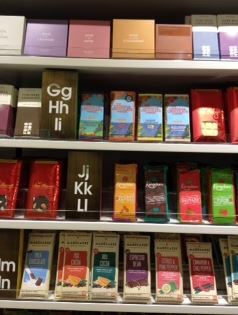 Now, I was surprised to not see chocolate philanthropist Askinosie there given how much he does for the communities he works with but I gues Selfridges still has to work on their ethical chocolate selection. Thankfully they do have Original Beans chocolate who plant a tree for each bar sold. 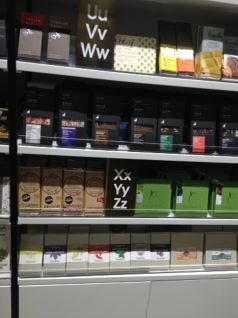 The Chocolate Library will comprise of over 400 new chocolate bars, ranging from A-Z, so whether customers are after something dark and sultry, heavily loaded with 70% cacao, a bean to bar (made from the producers who own the plantation) such as Willies Cacao, or just a plain bar of good old milk chocolate – Selfridges has the widest range of chocolate in the UK. Remember I mentioned camel’s milk? Well, if you have a dairy intolerance, besides the Askinosie goat milk offering not yet available at Selfridges, you could opt for the camel’s milk bar. This will be less bitter but I’m not sure I’d opt for it unless I had to (whereas the goat’s milk was amazeballs). There is some extremely rare chocolate there to with small batch chocolate from companies still handwriting their labels. There are also a few larger makers but the key to the Selfridges chocolate library is that it will be changing regularly. It will evolve and change because chocolate evolves and changes and what is available from Naieve and Akesson now might not be in five months time. This month’s Indio Rojo chocolate from Duffy may be used up completely and so can’t be restocked. What does this mean for you – the chocolate adventurer? I wonder if they aren’t selling Askinosie because they were coming via Sweden and that was an exclusive relationship that failed? I’ll try to suggest they get some in! I, too, have had the camel’s milk chocolate and quite liked the dark chocolate version with dates. 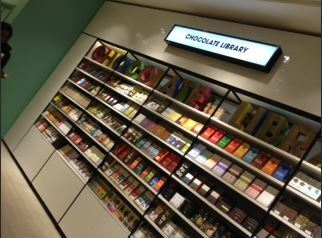 I think it’s really cool what Selfridges is doing with their chocolate library. I can’t wait to check it out!